Hirsute History "Andre the Giant"
Unlike the Obey logo, I feel like this shirt is more of a tribute to one of the WWF’s greats, Andre the Giant. I really like what Hirsute History has going on with their minimalist portraits. Everyone from 80s wrestlers to artists to commies are featured by Hirsute. I also like the informative “I’d like to know more about this person (wikipedia)” link that accompanies each design. There are quite a few t shirt styles and t shirt color options for each design. I’m a fan of the standard red on gold American Apparel shirt, but it also depends on the subject of the portrait. Just a hint – if you click the “I would prefer this design without the text” link below the design, you have even more control with the option to change the imprint color and a larger selection of t shirt styles. 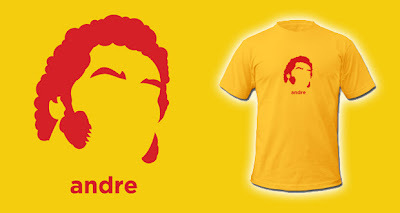 If you purchase one, just try not to coordinate your hairstyle with the one portrayed on your shirt.